There is a theory which states that if ever anyone discovers exactly what the Universe is for and why it is here, it will instantly disappear and be replaced by something even more bizarre and inexplicable. There is another theory which states that this has already happened. Riley: <in her best George Takei impersonantion> oh my! In many ways, Riley’s innocence is something we all share, and all too often it is lost too early. Spring 2000. Y2K had come and gone with a whimper (where was the chaos I was promised?). My father had passed away the previous fall (miss you Dad!). And I had just returned to college after a nearly 4 year hiatus. There are, it has been said, two types of people in the world. There are those who, when presented with a glass that is exactly half full, say: this glass is half full. And then there are those who say: this glass is half empty. The world belongs, however, to those who can look at the glass and say: What’s up with this glass? Excuse me? Excuse me? This is my glass? I don’t think so. My glass was full! And it was a bigger glass! Well, the journal has been up now for a couple of weeks and I’ve yet to properly introduce myself. My name is Jeremy, and I’m an aspiring writer and amateur photographer. I am also <insert ominous music here> The Dingo. But shhhhh, don’t tell anyone. I’d hate for my secret identity to be leaked to the press. From an educational standpoint, I hold two degrees – a B.A. in psychology and another in theatre arts. This means that I am able to understand crazy so that I can be crazy. My friends can testify to the fact that I probably didn’t need a university education for this to apply to me. 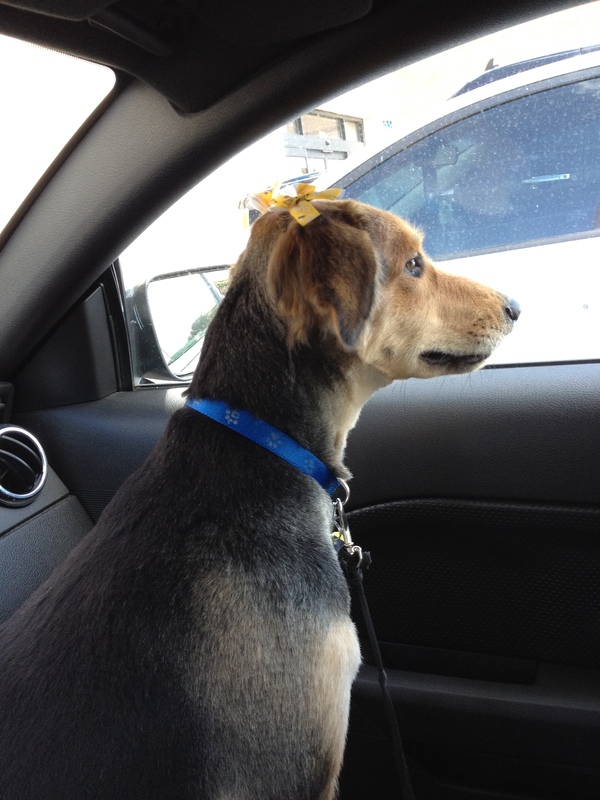 She liked the bows so well that by the time we got home from the groomers she was eating them. She has pretty good taste – those are fancy and plastic and yellow, after all. Yum. The reason that I decided to create this journal is that I wanted to have a creative outlet that I can share with other people. My secret motive is that I have become lax and I spend way too much time on the computer (writing an online journal should help with getting away from the computer, don’t you think?). As I very rarely share any of my work, I am not nearly as diligent as I should be about creating it. That, dear reader, is where you come into the picture. MONDAYS: Random articles about random things, and if I am particularly lazy perhaps just a movie review. (Did I mention I like movies? I didn’t think so. I mean, why would would a trained actor who doesn’t actually act enjoy watching actors who do act?). WEDNESDAYS: A weekly log of the deep and philosophical conversations I have with Riley. She has a lot to say about our American culture and society. I can’t keep up with her intellectually. “Conversations with Riley” is my way to ask for your help in understanding her viewpoints. Please, leave comments explaining it to me. FRIDAYS: “Eye of the Beholder” is my attempt at sharing my amateur photography with the world. I admit I still have a lot to learn about photography, but I hope you enjoy looking at them as much as I enjoy taking them. I also hope to post additional randomness on random days as the random mood strikes me.